At E&E Construction, we provide professional commercial roofing services for all types of commercial roofs. From repairs to replacement and restoration, our technicians are trained to provide efficient, quality workmanship no matter the size or type of job. At E&E Construction, we have spent the last 10 years serving customers throughout Ohio, West Virginia, Kentucky, and Indiana. We pride ourselves on a company culture that brings world-class customer care and outstanding craftsmanship together, all at cost-competitive rates. Call (740) 331-0695 today to learn more about how we can help you! Commercial Roof Repair – We provide repair services for all types of roofs, including metal, TPO, modified bitumen, EPDM (rubber), PVC, built-up (BUR), and more. Commercial Roof Replacement – We are qualified to evaluate your roof and let you know if it is, indeed, time for a complete replacement. 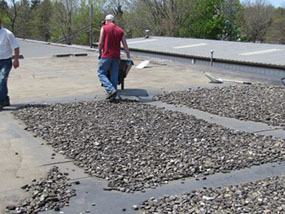 (Some estimates project that as many as 80% of all commercial roofs are prematurely replaced.) If your roof is at the end of its service life, we can take care of replacing it – from tear-off and disposal to installing a new, high-performing roof. Coatings – E&E Construction offers fluid-applied coatings for flat, metal, rubber, and elastomeric roofs. Our premier coatings are formulated by national manufacturer Conklin, a company that has been in the roof coating business for more than 40 years. 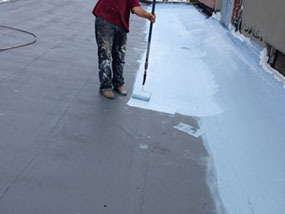 Spray Foam Roofing – We also install spray polyurethane foam (SPF) roofing systems for commercial roofing clients, which provide high-grade insulation and exceptional protection. SPF application efficiently controls air filtration, adds building strength and helps cut cooling and heating costs. Roof Inspections – Whether you need to diagnose a current problem, or just want the peace of mind knowing a professional is keeping an eye on your commercial roof investment, our roof inspections offer a comprehensive lookover and full status report. Roof Maintenance – At E&E, we understand that your commercial roof is a long-term investment. With that in mind, we offer ongoing, fully customizable maintenance plans for clients that include regular inspections, reports (for insurance purposes), and maintenance work. Over the last 10 years, E&E has built a reputation based on customer satisfaction and quality work. At E&E, every job is a priority and a chance to prove our dedication to our craft. No matter the size or location of the job, we strive to provide high-quality results. We hold accreditation with multiple institutions, including the Better Business Bureau and the National Roofing Contractors Association. We plan on being around for a long time, so we take the time to complete each job to both your and our satisfaction, and even to exceed your expectations.